Ronald Reagan was the 40th President of the United States who served in office from January 20, 1981 to January 20, 1989. What was the life of Ronald Reagan like? The short biography of President Ronald Reagan covers important information and facts about his early life, his family, career and the famous events and achievements of his political life. 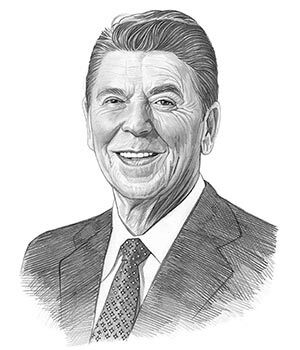 Our short biography of Ronald Reagan provides an interesting and easy way to learn about the life of the President. The following important facts provide a fast overview of important facts about President Ronald Reagan. Facts and Info: Ronald Reagan was the 40th president of America. He enjoyed great popularity, although his conservative policies were often controversial. His domestic policies encouraged entrepreneurship and his presidency saw substantial economic recovery. His foreign policies were heavily anti-communist and he encouraged new defence technology so that the US could confront the Soviet Union and its allies. He is particularly remembered for forging a strong relationship with Britain. For additional info refer to 20 Facts about Ronald Reagan. Facts and Info: Ronald Reagan was born on June 6th, 1911, in Tampico, Illinois. Reagan's father was a salesman, the descendant of Irish Catholic immigrants. From humble beginnings Ronald Reagan became a famous movie actor and made an amazing career move to become the President of America. He died on June 5, 2004 in Los Angeles, California. Facts and Info: The career of Ronald Reagan included the roles of Lifeguard, Actor and Politician. He was educated at Eureka College leaving with a Bachelor of Arts degree in economics and sociology. He became the 40th President of America in 1981 and served for 8 years until 1989. Facts and Info: Ronald Reagan married his first wife, actress, Jane Wyman in 1940 but they divorced in 1948. On March 4, 1952 he married Nancy Davis who brought glamour and elegance to the White House in her role of First Lady. Ronald Reagan had 4 children. Their names are Maureen, Michael, Patricia and Ronald Prescott. Facts and Info: Ronald Reagan belonged to the Republican Political Party. He was 69 years old when he was inaugurated as the 40th president. George H. Bush stood as the Vice President. His nicknames were “Dutch,” “The Gipper,” and the “The Great Communicator”. For additional facts refer to his Presidential Cabinet members. Short Biography of Ronald Reagan: What he was like! Facts and Info: He was an imposing figure standing at 6 feet 1 inches in height and weighing approximately 185 lbs. A strikingly handsome man, he had thick brown hair with only a touch of gray, blue eyes and an engaging smile. Ronald Reagan spoke in a clear, well-modulated voice developed during his years as an actor. He wore contact lenses and a hearing aid. He saved the lives of 77 people when he worked as a lifeguard and in 1937, Ronald Reagan won a seven-year contract with Warner Brothers and became a famous movie and television actor. Facts and Info: During his lifetime he played a key role in important events of the era. Ronald Reagan survived an assassination attempt in 1981 at the start of his presidency. Shortly after being shot, Reagan jokingly said, "I forgot to duck." His administration saw the U.S. invasion of Grenada that led to the installation of a pro-American government to replace the former communist rule. The Iran-Contra Scandal, known as Irangate, was uncovered, revealing that proceeds from secret US arms sales to Iran were used illegally to fund Contra rebels in Nicaragua. In 1991 US forces played a dominant role in the war against Iraq, which was triggered by Iraq's invasion of Kuwait. Facts and Info: During his life Ronald Reagan suffered from various health problems including Nearsightedness (myopia), Arthritis, Hearing loss and Alzheimer's disease. Facts and Info: He died of pneumonia on June 5, 2004 in Los Angeles, California. His seven-day state funeral followed and he was buried in Simi Valley. His funeral was attended by a mixture of politicians and movie actors. The short biography of Ronald Reagan provides a fast overview of the key facts and events about his life and the accomplishments of his presidential term in office. The following Ronald Reagan video enables you to sit back and listen to the history of his personal and political life - a useful educational resource for kids, children and schools learning about the life of President Ronald Reagan.